Initial proposals from both the White House and Republican congressional leaders to avoid the fiscal cliff do not include new cuts to defense spending under sequestration, Defense News reports. John Bennett writes the White House’s proposal would defer the $1.2 trillion in both defense and nondefense cuts covered under the sequester for an undetermined length of time. The proposal from House Republican lawmakers does not mention the sequester at all, according to Bennett. House Speaker John Boehner (R-Ohio) also proposed $800 billion in new federal revenue through closing loopholes and deductions without raising rates, a letter obtained by Defense News says. 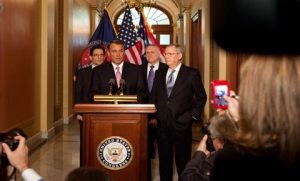 Bloomberg reports Republicans have offered a $2.2 trillion deficit reduction package in response to President Barack Obama’s proposal for tax increase on wealthy Americans. Under the GOP plan, entitlement program costs would see a $900 billion cut, $300 billion would be cut from discretionary spending and the Medicare eligibility age would increase. That plan did not include a specific age for eligibility, James Rowley and Heidi Przybyla write.